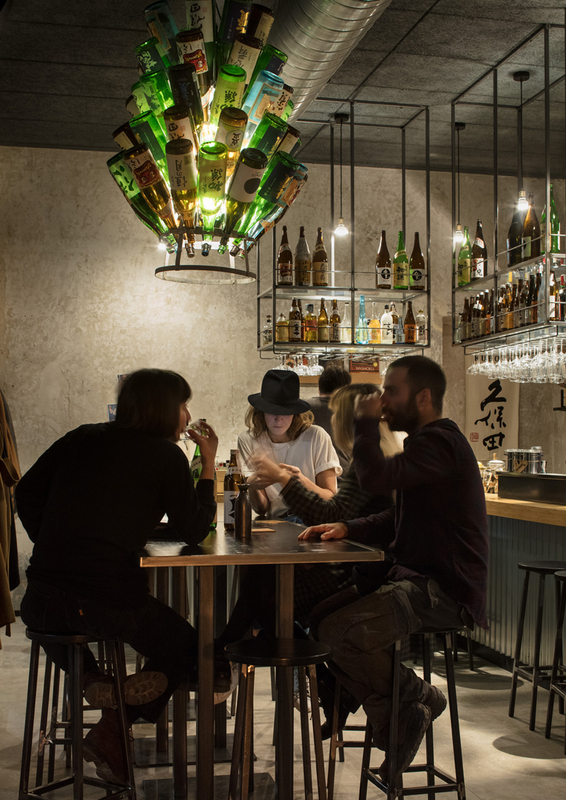 Designed by Vudafieri-Saverino Partners, Kanpai, an informal Japanese pub style restaurant known as “izakaya,” stands out amongst the other pubs and restaurants in the heart of Milan, Italy. “Izakaya,” in Japan are places for casual late-night drinking, similar to American taverns, Irish pubs or tapas bars. They are places for socializing with alcoholic beverages, such as sake, being the primary focal point and food being secondary. This is why when food is ordered it usually arrives slowly, over a period of time and in smaller portions throughout the night. The restaurant is spread across three rooms, the bar is the first room welcoming guests. Here, metal fuses with bamboo creating a blend of Japanese design and contemporary industrial style. Above, an art installation to be used as a lampshade hovers overhead made of different types of sake bottles hung from an antique french bottle rack. The colors of the bottles and their labels act as a diffuser of light, adding even more warmth and artistic allure to the space. “Not a stereotype of the traditional Japanese rice paper, but of what can be seen in Tokyo today, reconciling the local street soul tradition with an approach attentive to detail and to some gourmet proposals,” the owner of the venue describes. 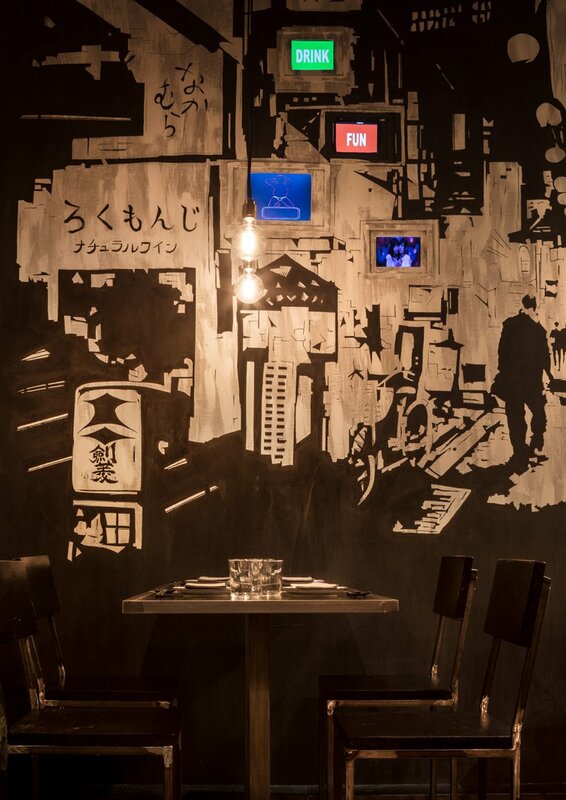 In the main room, the interior design features a black and white, distressed stencil art collage of urban Japan. The mural is created by street artist Alessandro Di Vicino. Embedded into the walls are small digital screens transmitting keywords and pop images relative to today’s Tokyo. 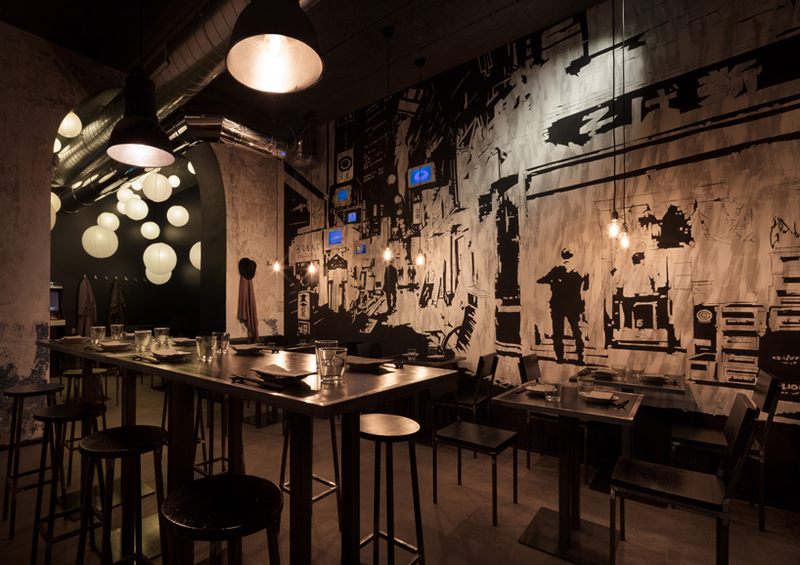 The restaurant is a blend of eclectic, industrial and contemporary style. Many of the buildings raw and natural features were preserved using many imperfections as important elements to the overall interior design. 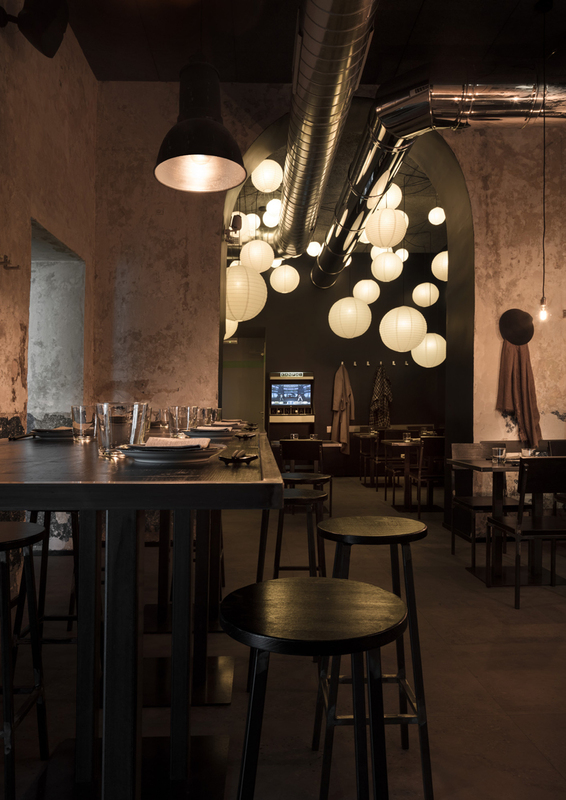 In this area, most of the furnishings, such as the barstools, dining chairs and tables have a minimalist design with a dark wenge wood and a slight antique finish. The lighting consists of hanging pendants, many of which are exposed lightbulbs. 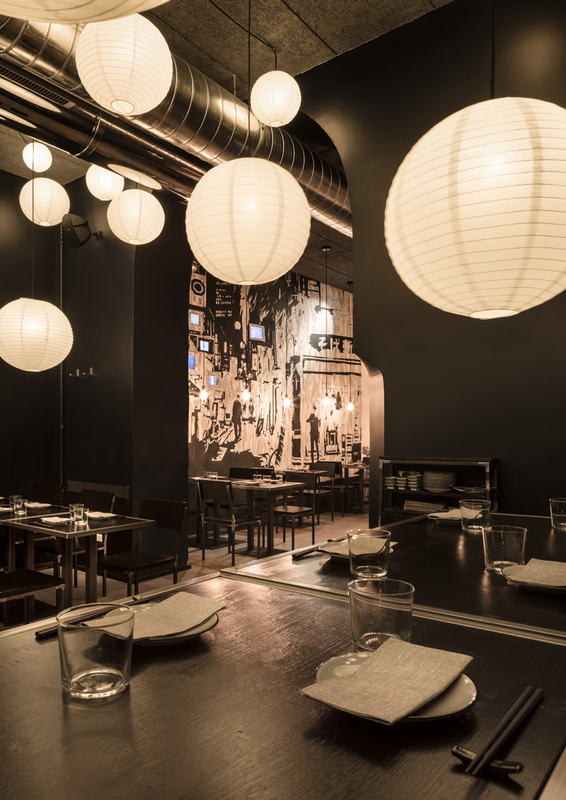 In the third room, over 50 rice paper lanterns hang from the ceiling, their orb-shapes floating above in tones of yellow and orange create a laid-back and relaxed atmosphere for diners and bar-goers.